When you come into the land that the LORD your God is giving you, you shall not learn to follow the abominable practices of those nations. There shall not be found among you anyone who burns his son or his daughter as an offering, anyone who practices divination or tells fortunes or interprets omens, or a sorcerer or a charmer or a medium or a necromancer or one who inquires of the dead, for whoever does these things is an abomination to the LORD. And because of these abominations the LORD your God is driving them out before you. You shall be blameless before the LORD your God, for these nations, which you are about to dispossess, listen to fortune-tellers and to diviners. But as for you, the LORD your God has not allowed you to do this. 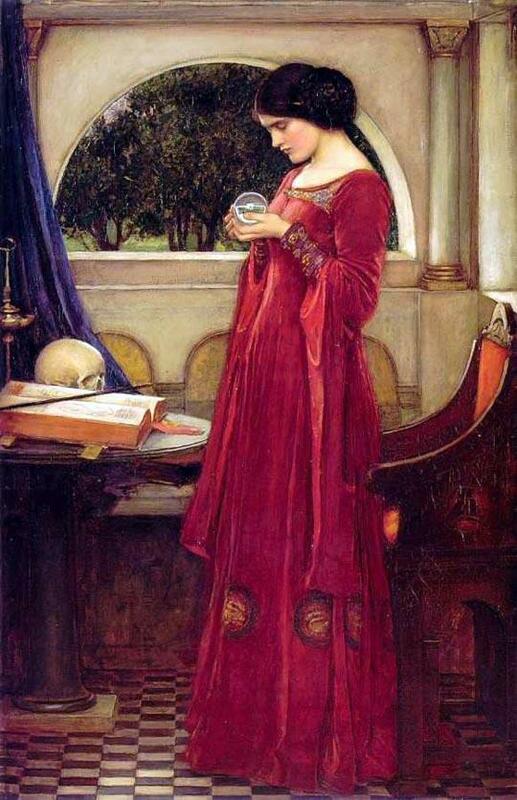 Divination is the practice of seeking knowledge by supernatural (some would say psychic) means. The literal meaning of the word is “to let the divine realm manifest.” Cultures all throughout history have engaged in countless methods to predict the future, to gain knowledge and wisdom, and to communicate with realms beyond the physical in order to gain perspective on the here and now. Modern day psychics, holy people and diviners of all types still use ancient and even modern divination techniques to glimpse the unseen realms. They all work in different ways to convey information between the dimensions, but what they all have in common is that they are merely tools in much the same way a telephone is a tool to transmit communication between people in remote locations. Tarot card reading is one of the most popular and commonly used divining tools to this day and falls into a category of divination called cartomancy (divining through cards). With its history in medieval Europe, tarot cards were originally a card game that evolved into a system of divination. It works by reflecting the energy of the person consulting the cards. A question is asked (it shouldn’t be a yes or no question) and the reader lays the cards down in a particular pattern (and there are many depending on the type of reading). What cards come up in what position, and whether or not they are right side up determines how it will be interpreted. A good reader skilled in the tarot will understand the subtler nuances in the symbology of the images. For example, the Death card does not necessarily portend that someone is going to die, but will often signal something more along the lines of personal transformation. There are several types of astrology. The most well known are Western astrology and Chinese astrology. The word “astrology” is derived from the Greek words “astron” (meaning star) and “logos” (to study). Astrology is the study of the position of the stars and other celestial bodies at any given moment in time and their relationship to and influence on human lives. Most people are familiar with astrology in the form of daily horoscopes, but there is actually far more to the study of astrology than that. The beginning point of any personal astrological reading is the natal chart. It diagrams where all the most relevant celestial bodies were at the time of your birth. Your sun sign may be the dominant energy in your life, but the placement of the moon and all the stars and planets also describe significant energy patterns that can influence the characteristics of the sun sign. This is why it’s important to have a natal chart done if you are going to have an astrology reading, and any good astrologer will tell you that. Also known as chiromancy, the art of reading hands is one of the most ancient forms of divination. There are debates as to whether or not palmistry is a fortune telling method of divination. While it is more of a technique for personality assessment, there are elements by which palm readers can predict the future. Contrary to popular opinion, palmistry involves more than just studying the lines of palm. A palm reader also looks at things like fingernails, hair growth, and color and texture of the skin. Classical palmistry has its roots in ancient Greece. The dominant hand will convey a certain set of meanings while the non-dominant hand will convey another, and it depends on what school of palmistry one has been taught. Some of the most common elements of a palm reading are looking at the life line, the heart line and the head line, which are the three most dominant lines in the palm. The Ouija board also known as a spirit board or talking board, is a flat board marked with the letters of the alphabet, the numbers 0-9, the words “yes,, “no,” “hello” (occasionally), and “goodbye,” along with various symbols and graphics. It is a registered trademark of Hasbro Inc., which markets and distributes the Ouija Board as part of its line of board games. It uses a planchette (small heart-shaped piece of wood) or movable indicator to indicate the spirit’s message by spelling it out on the board during a séance. Participants place their fingers on the planchette and it is moved about the board to spell out words. It has become a trademark that is often used generically to refer to any talking board. Mainstream religions and some occultists have associated use of the Ouija board with the threat of demonic possession and some have cautioned their followers not to use Ouija boards. While Ouija believers feel the paranormal or supernatural is responsible for Ouija’s action, it is parsimoniously explained by unconscious movements of those controlling the pointer, a psychophysiological phenomenon known as the ideomotor effect. Despite being repeatedly debunked by the efforts of the scientific community and denounced as a tool of Satan by conservative Christians, Ouija remains popular among many people. Scrying (also called seeing or peeping) is a magic practice that involves seeing things psychically in a medium, usually for purposes of obtaining spiritual visions and less often for purposes of divination or fortune-telling. The most common media used are reflective, translucent, or luminescent substances such as crystals, stones, glass, mirrors, water, fire, or smoke. Scrying has been used in many cultures as a means of divining the past, present, or future. Depending on the culture and practice, the visions that come when one stares into the media are thought to come from God, spirits, the psychic mind, the devil, or the subconscious. In his First Epistle to Timothy, Paul the Apostle wrote. “Now the Spirit speaketh expressly, that in the latter times some shall depart from the faith, giving heed to seducing spirits, and doctrines of devils” (1 Timothy 4:1 KJV). Exposing the Occult may be one of the finest websites available to those who are struggling with any of these or other issues. Excellent post Mark! You are on a roll my brother!